MCN has ridden the staggering Triumph Rocket III – the heavyweight cruiser which Triumph claims can beat an R1 to 100mph - at its world launch in the United States. Here’s some of what Kevin Ash had to say about the bike: “Press the starter and the monster awakes with only a chesty quality to the exhaust to suggest anything special. Some typically Triumph whistles and whirrings add aural flavour. “Into first with a slightly notchy action and you’re ready to find out what 147ftlb at 2500rpm really feels like. 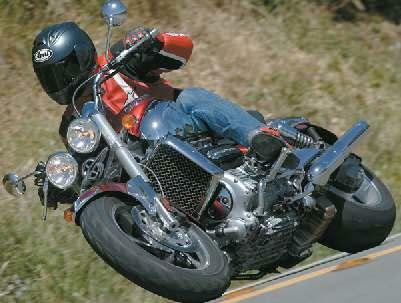 Snap open the throttle and the bike surges forward with huge force, despite the 320kg dry weight. Sometimes the thrust forward is shockingly hard. “Give it some revs from a standstill, drop the clutch and be fired off the line faster than anything you’re likely to experience. Triumph claims a quicker 0-100mph time than an R1 and a 0-60mph of 2.8 seconds. “The chassis deserves plenty of praise. The handling is exceptional for a cruiser, blending top stability with surprising agility and easy, neutral steering. Inevitably the bike will run wide when pushed in corners, but you need to make few concessions to the nature of the beast on a twisty road. “The soft suspension gets bouncy when you’re trying hard, but not overly flustered, and compensates with superb ride quality at lower speeds (which for all its power the bike is designed for, being aimed primarily at the American market). Read our full test report plus, exclusively in MCN, out on Wednesday June 16, 2004.